The root tuber of perennial herb Trichosanthes kirilowii Maxim. Mainly in Henan, Shandong and Jiangsu Provinces of China. No bad smell and slightly bitter taste. Solid texture, white or yellowish section, rich in powder. Use the unprocessed one or the fresh one. Sweet, slightly bitter and slightly cold; lung and stomach meridians entered. Clear heat and purge fire, generate body fluids and quench thirst, moisten dryness and resolve phlegm. It is stronger at generating fluids to quench thirst than clearing qi-system heat. For thirst due to excess heat at qi system consuming body fluids, it is commonly combined with herbs for clearing heat at qi system, such as Shi Gao and Zhi Mu in Gua Lou Gen Tang from Zheng Yin Mai Zhi. For thirst of exterior-heat syndrome, it is combined with herbs for dispelling wind-heat to clear heat and generate body fluids. It can generate body fluids and quench thirst, clear and purge stomach heat and be commonly indicated for thirst due to stomach heat accumulation. It can be used alone to quench extreme thirst, described in Qian Jin Fang or combined with herbs for clearing stomach heat and generating body fluids, such as Mai Men Dong, Lu Gen and Bai Mao Gen from Qian Jin Fang. For diabetes caused by damage of qi and yin and yin deficiency as root, manifested as dry heat, it is commonly combined with herbs for tonifying qi and nourishing yin, such as Yu Ye Tang from Yi Xue Zhong Zhong Can Xi Lu, it is combined with Huang Qi, Shan Yao, and Wu Wei Zi, etc. It can clear lung heat, moisten dry lung and be indicated for cough due to lung heat and dry heat. For dry heat damaging lung, dry cough with scanty sticky sputum or blood in sputum, it is combined with herbs for clearing lung heat and nourishing lung yin such as Sha Shen, Mai Dong, as recorded in Sha Shen Mai Dong Tang from Wen Bing Tiao Bian. 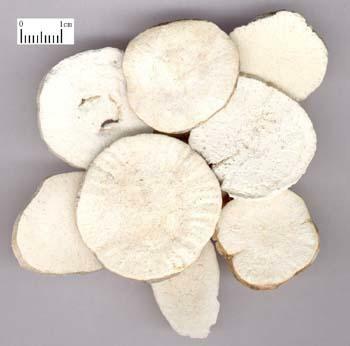 It has slight actions of clearing heat and relieving toxicity and can relieve the swollen and promote pus discharge. For the red, swollen, hot and painful sores and abscesses due to extreme heat toxin, it can be used alone or combined with heat-clearing and toxicity-relieving herbs such as Da Huang, Zi Hua Di Ding in a way of orally taking or externally applying. For pus-draining and toxicity-expelling, it is better with herbs for ronifying qi and blood and activating blood such as Huang Qi, Dang Gui,Chuan Shan Jia. For it has the actions of activating blood, it is often indicated for swelling and pain of injury from knocks and falls, usually combined with blood-activating and stasis-resolving herbs such as Tao Ren, Hong Hua for painful swelling of trauma and injuries. Decoct 10～15g. Apply proper dose externally.